Today's installment of what did the fat guy do at Warrior Crossfit consisted of: Warming up with three rounds of the barbell complex, followed by a challenging series of pull ups and dips and then the Workout of the Day. That consisted of three rounds of sandbag stand ups, step ups and Burpees. Remember what it was like as a child to get a shiny, new toy? You know, the one you played with nonstop until you broke it or grew bored with it. For me, that’s what working out at Warrior Crossfit Muscatine has been like since I hesitantly walked into the door. While that’s overall a good thing, the downside is that I will probably keep writing about it until the newness wears off. Or until I get another new, shiny toy. Last week, I would have said: Or, until I drop dead. But I’m starting to not worry about that quite so much. The numbers on the left show the weight of the sandbag used by each participant. 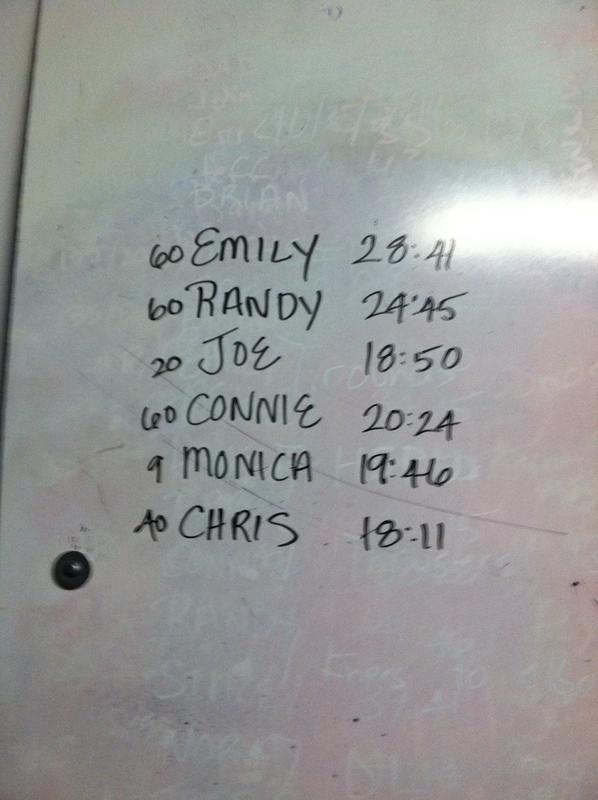 The numbers on the right show the times each person completed the Workout of the Day. Sandbag stand ups — I laid down on the floor, grabbed a 40-pound sandbag and placed it on my shoulder before sitting up and then standing up — 21 times in Round 1, 15 times in Round 2 and nine times in Round 3. Let’s just say it was a good reminder of all those years of carrying 50-pound bags of feed and seed around on my shoulders. Burpees — The same three rounds and number of repetitions as the stand ups. We did these by the thousands during my years as a high school wrestler and I will never be able to do them without hearing Gary Wood, who was the Chariton High School wrestling coach back then, yelling at us and chirping on his whistle each time we hit the mat. In additions to the stand ups and the Burpees, we did the same number of sets and repetitions of step ups on to a 24-inch wooden block. I guess I have no emotional history with the step ups, but the wave of nostalgia returned an hour so after I had finished the workout. That’s about when I realized doing all of those Burpees on the rubber floor mats at the gym had left my knees with a feeling that can only be compared to carpet burns. And that’s probably all I dare to say about that. A few extra notes: In what only can be termed an aberration, by the time I finished the 7:30 session this morning, I had posted the fastest time in the Workout of the Day. Since that will likely never happen again, I quickly took the picture posted above. I hope Jacob or Sarah Garvin, the gym’s owners, will log on later in the comments to give some publicity to the real athletes who have undoubtedly posted better times since then. After finishing up at Crossfit, I headed to the Muscatine Community Y and joined a spinning class before taking a shower for the day. I also stepped on the scales long enough to see I’ve lost about 10 pounds. That makes me happy, but maybe even more important is the fact that I simply feel stronger. At least I think that’s what I’m feeling whenever the soreness lets up for a few minutes. Lori, I hope Jacob or Sarah will chime in to answer your question about their gym. Since they opened, I think Jacob and Sarah have learned how to tone down their workouts a bit for beginners. 1. The Boot Camp Lite class taught at 5:45 a.m. on Mondays by Marnee Acker. 2. The group strength classes taught by Marnee and Danelle Much. They keep switching their schedules around, so I can’t remember who teaches which class on what day. But they are both very good instructors and they teach very useful classes. You will use light dumbbells, resistance bands, exercise balls, etc. In these classes, you will find a wide variety of excercisers. But many of them are women who are older than you. Finally, if the Y isn’t your thing, you could do a lot of this stuff at home. I can’t remember if you have an iPhone or a smart phone. But if you do, you should try two free apps that I have used and like: Nike Training Club and Workout Trainer by Skimble. These have hundreds of workouts on them and all you need are a few dumbbells, maybe an exercise mat, an exercise ball, a medicine ball and a jump rope. Now to the burning question: Did you take that 1977 Schwinn to Harper’s today? Way to go Chris! You are an inspiration!! I am a creature of habit (with the Y) but I have thought I wanted to give it a try. I want to make sure Mark (who says there’s no time) reads this and maybe we can get him and Nancy to give it a try (everyones schedules permitting of course). Thanks, Becky. I guess if I have anything of value right now it is time. Thank you, Chris, for chronicling your CrossFit experiences on here! I know there is a lot of mystery surrounding what it is exactly that we do down at 211 E 2nd St morning, noon, and night, and we appreciate you shedding some light. And regardless of the cheesiness of this next statement, every athlete that works out with us is a “real” athlete (including YOU, Chris)! Each person is just at a different point in their skill development. There is no reason to think that you could not or should not be rivaling anyone else in the gym if you stay consistent and work hard. Jacob and I constantly emphasize the idea of progress — making those day-to-day and week-to-week gains — which make you turn around after 2 months and realize how far you’ve come. I’ll come back to this idea in a minute. As for “remedial” classes, CrossFit is meant for everyone. It focuses on functional movement, which is movement that mimics every day activities. Squats are standing from a seated position; deadlifting is picking up something off the floor; and your post above illustrated perfectly the usefulness of sandbag standups. Jacob and I work hard to make every exercise and every WOD (workout of the day) “hard but doable” for every person that comes in depending on their skill and ability level. For beginners, we highly recommend starting with the Elements I and II classes on Tuesdays and Thursdays, where we teach the more technical exercises involving the barbell. We use little or no weight during these classes. Once athletes “graduate” from these classes and enter in the regular weekday and Saturday classes, we continue scaling the weight and modifying movements. For example, today someone with little upper body or core strength might use only their body weight for the sandbag getups. Instead of box jumps, they would do step ups. If they could not step very high, we would use a short stack of weights. 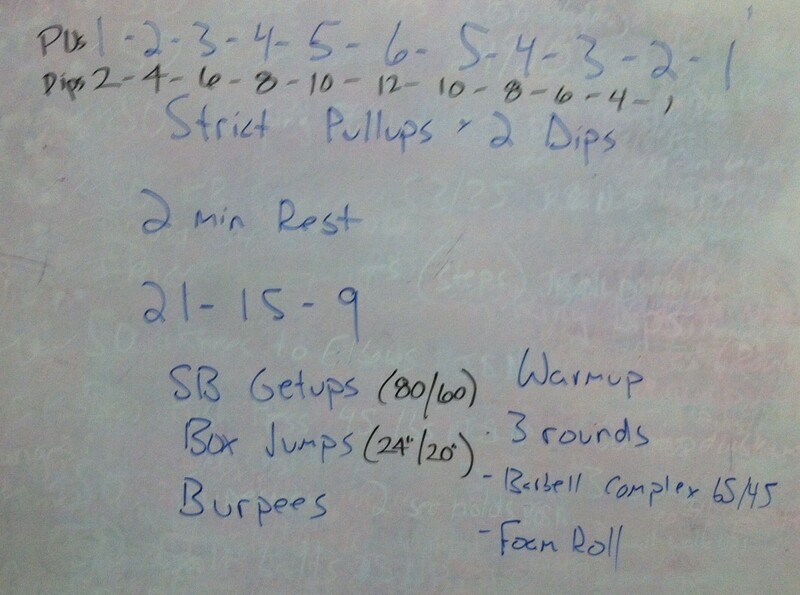 Jacob and I modify the day’s WOD to the level of the athlete. A lot of people get hung up on the amount of weight they are (or are not) using and the type of modifications they need to complete the WOD. This troubles both Jacob and me because everyone starts somewhere, and we feel comparing one’s self to others during the WOD hinders progress. The people in our gym didn’t start where you see them now. Six months ago they were using less weight, or no weight. One woman that started with no weight is now lifting 45 pounds overhead. She got to this point because she stayed consistent and Jacob and I continued challenging her as her skill and abilities progressed. Regardless of how we scale and modify your WOD, you are working as hard as anyone else in that gym. I apologize for the length of this comment! I could go on for days about the awesomeness of CrossFit and the benefits of CrossFit for anyone at any age and any ability. No doubt, CrossFit is HARD — it is supposed to be — the rewards inside and outside of the gym, as well as the physical and mental benefits are immense. Read through our site, especially the monthly newsletters that highlight our hardworking Warriors of the Month, and know that anyone can do this as long as they stick with it.